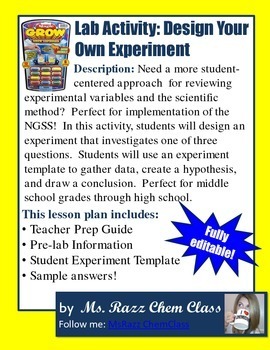 Need a more student-centered approach for reviewing experimental variables and the scientific method? Perfect for implementation of the NGSS! In this activity, students will design an experiment that investigates one of three questions. Students will use an experiment template to gather data, create a hypothesis, and draw a conclusion. Perfect for middle school grades through high school. 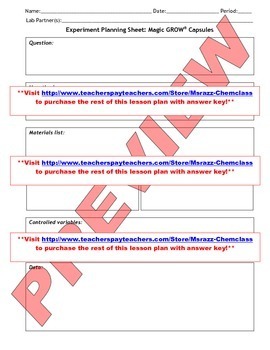 See the preview for the materials you will need to have on hand for your students. Please download the preview for more information. I hope you enjoy this activity as much as I do with my students. Saving YOU money: Lesson plan bundles! SAVE 20% NOW! 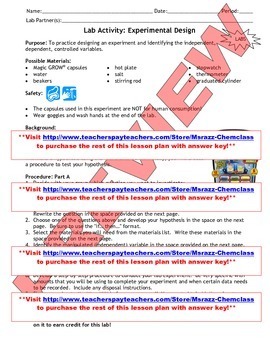 Homework Worksheets w/ Answer Keys! : Introduction to Chemistry! Lab Activity Bundle: Introduction to Chemistry – Safety, and Three Introduction Labs, With teacher prep guide! Lab: Design Your Own Lab - Perfect for NGSS! Stay connected for even more tips, tricks, and engaging lessons!